Rise and shine... early for the sharks! Over the weekend Marena and I worked on board both the Slashfin and Dreamcatcher boats. We awoke at sunrise (around 5.30am) and got ourselves ready before heading to the Great White House to help pack wetsuits and gear up the clients. Once the clients, the crew and ourselves were ready to go, we made our way down to the harbour to board Slashfin 1 (the first shark cage dive boat of the day). 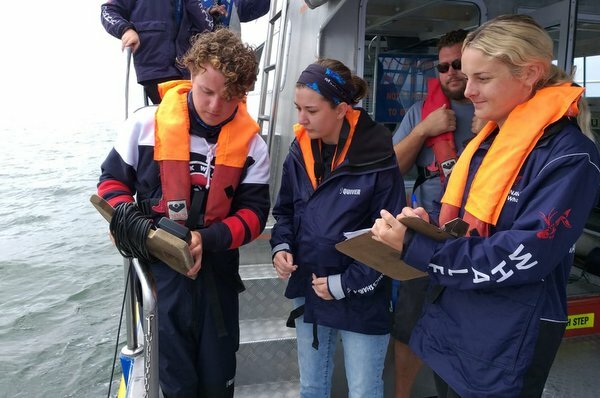 We had already familiarised ourselves with the boat and the way things are run prior to this trip, both as shark dive clients and as boat crew, so we used this knowledge to the best of our abilities and began helping on the boat. A typical day as an intern on board Slashfin consists of assisting the clients where necessary. For example, by guiding them to seats, helping them with their gear before and after their dive, or offering sick bags to those prone to a little sea-sickness (hey, it’s all a part of the experience!). We also do the YSI reading, fill in the data sheets, take photographs on the intern DSLR’s (or our own cameras) and help out anywhere else that we may be needed. The visibility around the dive site (The Shallows) was not as clear as the previous day, although it was still a fun trip to be a part of. Bronze Whalers were spotted around the boat, and all of the clients were happy. Overall, it was a great Saturday morning aboard Slashfin. After the first shark cage dive trip for Saturday, Marena and I then had a quick break before helping out the crew in preparation to board Dreamcatcher, the eco tour boat. This was our first eco tour, so it was very exciting! Although whale season has unfortunately come to an end, there is still an abundance of marine life to be witnessed aboard the vessel. The weather had also cleared up by then, blue skies with minimal clouds. Firstly, the boat stopped near a kelp forest, and the guide explained to the clients what kelp is and its benefits. One of the crew fished a piece out of the water and it was passed around to everyone to look at, and snack on if they desired. Yes, you heard that right! For those who are not aware, kelp is a large brown algae seaweed and it is highly nutritious. It contains a natural source of vitamins and minerals including B1, zinc, iron and a stack-load of calcium. 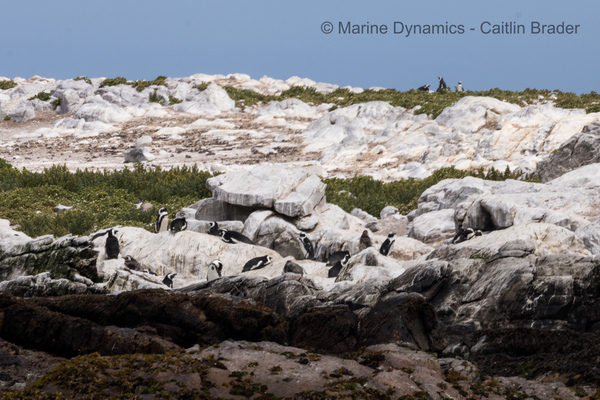 Moving on from seaweed, we also stopped by Dyer Island to seek out some African penguins (Spheniscus demersus) in their natural habitat, as well as other local seabirds. I enjoyed this, as I love penguins and would like to direct a large proportion of my conservation and research efforts towards them, especially the endangered species including the African penguin. 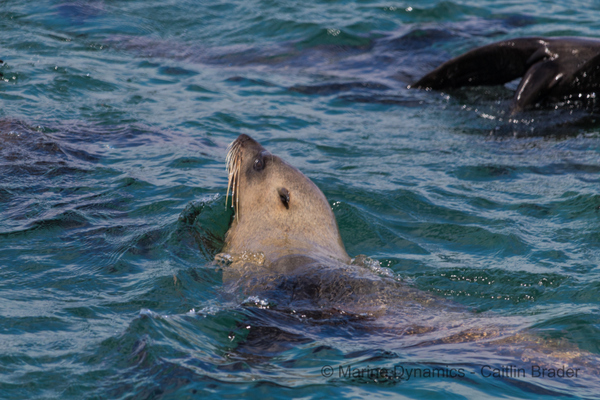 The last marine life sightings on board the eco tour were of the Cape Fur Seals (Arctocephalus pusillus) on Geyser Rock. A large number of these seals (~60,000 if you were wondering) inhabit the area, including a seemingly endless amount of little pups. Cute! I had never encountered this species of seal before and a fact worth noting for those who also haven’t is that they both smell and sound like sheep. These animals are extremely playful; the ones that weren’t sunbathing on the rocks were either slipping down the rocks (some very clumsily) into it, or swimming around the boat gliding in and out of the water. 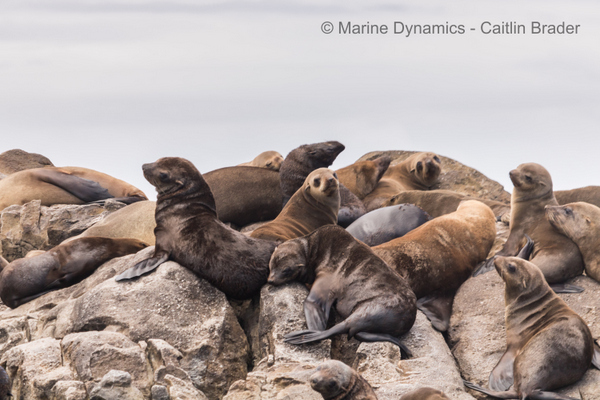 It is easy to mistake these seals for sea lions, as they have little ear flaps. 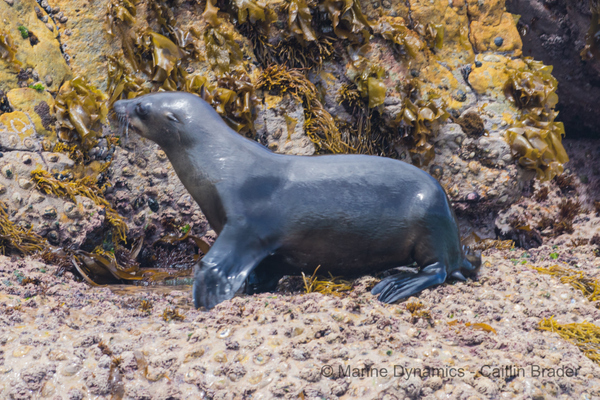 This can be confusing as true seals do not have external ears, while fur seals do. While they are still called seals, fur seals belong to the family Otariidae along with sea lions and true seals belong to the family Phocidae. Overall, the weekend trips aboard Slashfin and Dreamcatcher were both fun and educating. 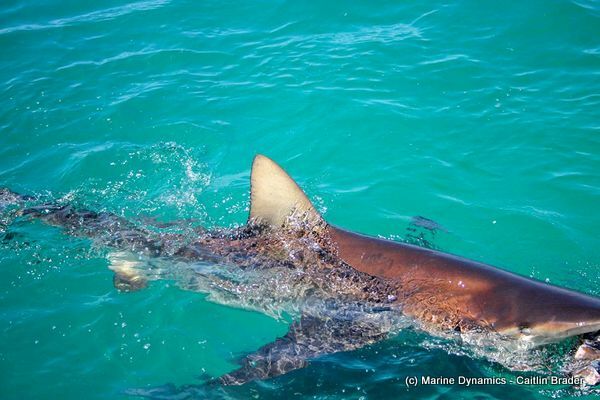 I learned more about the process and work that goes behind taking clients out to cage dive with sharks and view South Africa’s amazing marine life. 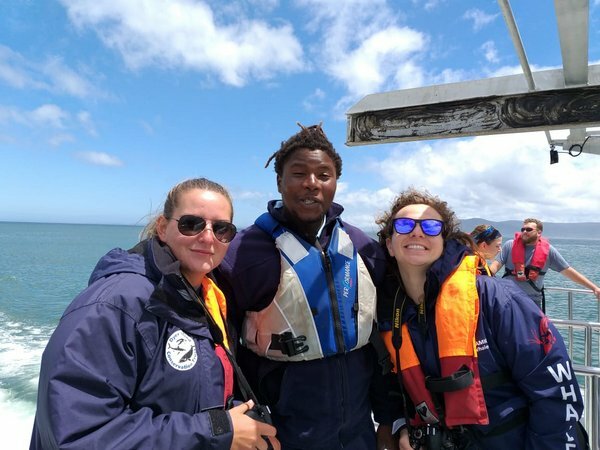 It is always exciting being a part of the boat crew, learning new skills and witnessing wild marine life I had not seen in person before my time here including Bronze Whalers, African Penguins and Cape Fur Seals.